I make functional pottery because I like the challenge of taking a ball of clay and turning into something both useful and beautiful. A mug or bowl is an everyday object that must be practical to have someone reach for it daily. It is the appeal of its simple beauty that transforms these functional pieces into art. I begin the process choosing the clay and where it is going to be fired. The electric kiln has a different color palette from the earthy tone of the wood fire. The electric kiln is more predictable and constant. The wood fire allows more unknowns and surprises, and the pieces for the wood fire need a little more surface area. I especially like making pieces for the wood fire with bulbous forms that have variations in the surface as the glaze and the flame have more flow. 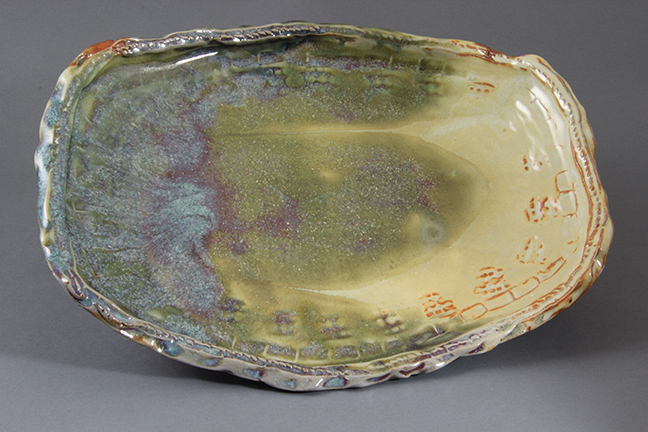 Even though I have been working on the same type of functional pottery for years, I enjoy the challenge of trying to alter the pieces with texture, form or glaze so they do not remain the same. When form, function and glaze all come together I feel I have made something that can be used and appreciated for a long time.